It’s been a patient few months for Audi, with the German firm biding its time while Jaguar and BMW have busied themselves with the launches of the new XE and updated 3 Series. However, not to be outdone by its rivals, Audi is finally striking back with an all-new version of the A4. The new Audi A4 gets some significant changes, with better aerodynamics, improved economy and reduced weight. The A4 weighs 140kg less than the old car, which probably explains why it’s so efficient, with the 2.0 TDI Ultra emitting 102g/km and returning up to 74.3mpg. Its company car friendly too, with a BiK rate of just 18 per cent. Those headline figures become all the more impressive when you factor in the four-cylinder's 190PS and 400Nm of torque. As a result this eco-focused A4 is quick and capable, covering 0-62mph in 7.7 seconds and good for a top speed of 130mph. 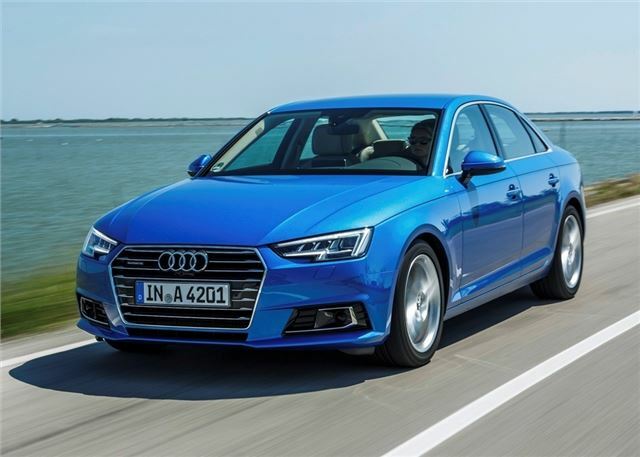 Admittedly, the new Audi A4 doesn’t look all that different from the old model, but there are some subtle changes to the exterior, with a larger radiator grille, sleeker housing for the xenon headlights (now fitted as standard) and smoother lines. This gives the impression of a slimmer and more toned A4, helped by vertical centre panels and upright doors. In reality the A4 isn't smaller, in fact it has actually grown and is now 25mm longer, sitting on a new wheelbase that’s longer than before. However, these new dimensions are hidden rather well and the extended wheelbase has contributed to this Audi having significantly more interior space. Inside, the A4 has more knee room in the back and better headroom in the front, making it easy to fit four large adults, with a 480-litre boot on hand to take everything that goes with them. There is a downside though, the centre seat is almost useless, with the rear climate controls and raised floor cutting legroom to zero. Audi tell us that the quality of A8 has been used as the benchmark for the interior of the A4. It is difficult to argue against that claim because the trim and fit of the cabin is excellent, with an intuitive design that’s covered in lots of expensive looking materials. The centre stack is neat and easy to understand with just a handful of buttons to operate the climate control, while the sports seats and padded door trims make it a comfortable place for long trips, with lots of support for your back and arms. In comparison, neither the BMW 3 Series or Jaguar XE comes close to matching the quality of the A4, it’s simply that good. Audi's MMI system - operated via a dial next to the gearstick - is fitted as standard and linked to a bright and clear 7.0-inch screen that sits aloft the centre dash. Operating the DAB or media is simple, thanks to the rotatory wheel and touchpad, which also accesses the navigation. As with several cars in the Audi line-up, a virtual cockpit is available as an option and this replaces the traditional instrument dials with a digital display system that can minimise the rev counter and speedo and enlarge cover the entire binnacle with a navigation map. The 190PS engine is sharp and refined, making it feel much more powerful than the official figures suggest, with maximum torque flowing seamlessly from 1750rpm which makes it effortless to change motorway lanes or overtake slower vehicles. 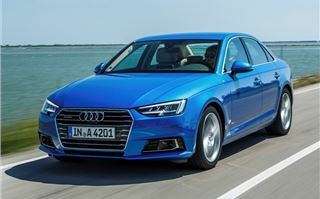 Audi has clearly worked hard to improve the agility of the A4 and it does feel a lot better, but it doesn't quite match the finesse of the BMW 3 Series or the rewarding cornering ability of the XE. That doesn't mean the A4 is sluggish to drive, but it isn't the sharpest car in this company and this is largely down to its front-wheel drive set-up that makes the A4 nose heavy. As with all Audi models, the price expands rapidly should you tick through options, but we found the entry-level Sport trim - the 190PS Ultra isn't available in SE - to be well-equipped with rear parking sensors, ambient lighting and navigation all included, along with selectable driving modes that sharpen or soften the ride to match your mood. Given the improvements, we have little trouble in recommending the new A4. Indeed, it's the best premium saloon you can buy for under £40,000, with lots of high quality materials, a serine cabin, a large boot, comfortable ride and surprisingly affordable running costs. Admittedly, it's not as fun to drive as its rivals, but when a car is this good at everything else, it hardly matters. The new Audi A4 is on sale now.